Welcome to my first informational couponing post! Couponing, although abused by some, can be one of the most rewarding ways to save money and relieve the pain of grocery costs. I started couponing in 2011. No one taught me, i just sat down one day and started figuring things out. It took a while, but it was so exciting once I learned how everything worked. 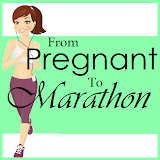 In 2013 I opened a small business, got out of the Army, had a baby, got married, and started training to run a full 26.2 mile marathon. 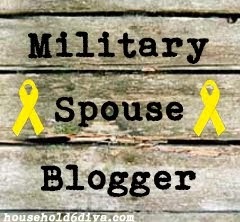 My husband was also deployed for some time so as you can imagine I was very busy. I got away from couponing throughout the year, but plan to get back into it for 2014. 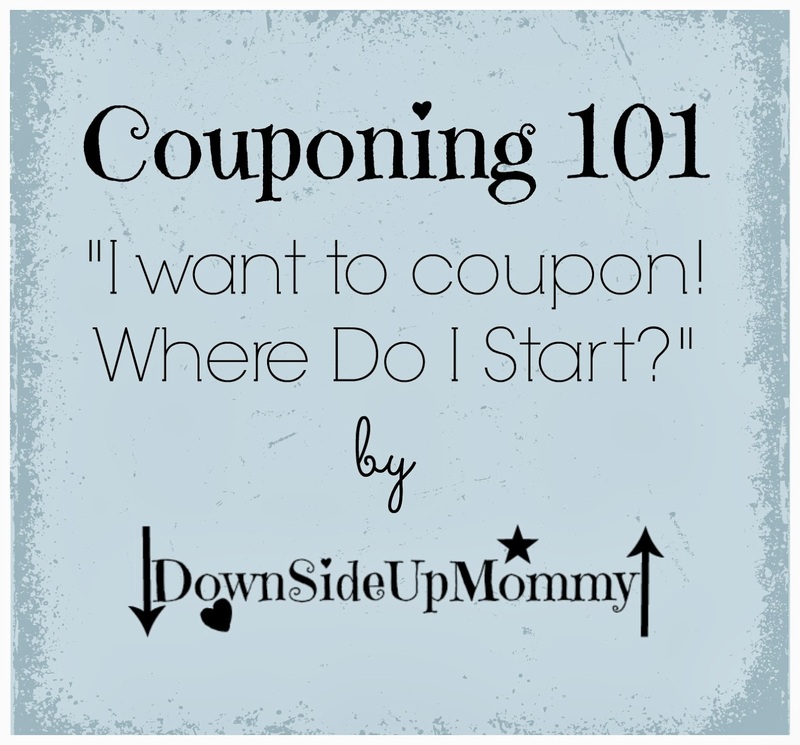 DownSideUpMommy.com was originally FOR couponing. I needed a place to share my recipes, my DIY, and everything else, so my blog kind of became place to dump my daily life. YES, It can be time consuming, but once you get into a routine and know what way of doing it best works for you, its just about maintaining! You will get out of it exactly what you put into it! I was working full time when I first started and I got 2 years worth of paper towels for $30 and a pantry packed full of food for next to nothing! It doesn't come over night, but once you get into it, you'll be glad you stuck with it! I want to coupon! Where do I start? The first thing I recommend is to make a email just for your couponing. This account will receive massive amounts of emails, so its good to keep it away from your personal email account. Keep up with it though, a lot of these emails contain great information, discount codes, sale notifications and sometimes free stuff. Find your favorite brands, foods, and companies. Go to their website and sign up for their newsletters. At first the emails can be a little overwhelming, but once you become a seasoned couponer, you will usually be able to tell which emails are worth keeping and which ones you should unsubscribe to. There will be times when you have to enter your email to receive offers, deals, and free stuff. This is the nature of the beast. That's why its always good to have the couponing email. If you decided you don't like the emails, there's always an "unsubscribe" link at the bottom of every email. If you're feeling motivated enough, you can always visit the webpage of your favorite brands and contact them. Tell them how much you love their products, let them know that you are getting into couponing, have subscribed to their newsletter and would love a coupon or two for their products! Most companies are happy that you took the time out of your day to write them, and have no problem sending you coupons and sometimes samples in the mail. Never miss a Sunday. I recommend you pick up 1 Sunday paper per person in your household. If you have a household of 4, then 4 papers would be a great start. Don't wipe them all out -- that would be poor couponing practice and just downright rude. Check around and ask your friends, neighbors and co-workers if they are using their coupons. The more coupons you can get without being a newspaper hoarder, the better! Sign up to get it in your driveway on Sundays for additional copies. Make sure you get your papers early in the morning! There are other couponers out there, and there is nothing more disappointing and discouraging then getting to the newspaper stand or check out and there's no newspapers! Make sure to recycle your newspapers! One of the most important things you can do for your couponing hobby is get a store loyalty card for any store that provides them. Make sure to make accounts at all the store sites and make sure your information is updated. Example: I have a MVP card from Food Lion. I went to Food Lion.com, made an account with my bobbiejocoupons@gmail.com email address, and made sure all the information on the MVP card was correct. If youre not comfortable with using your phone number, i recommend downloading an app like SendHub and getting an additional phone number (free) and using that number for all your couponing stuff. The last 4 digits of my actual number is 6704 so the last 4 of my phone number for couponing is 6700. This way its easy to remember, and I'm not giving my number out. I always use my couponing phone number at checkout if i forget my MVP card. Coming Up on Couponing: Part 2 - I got my Sunday Papers - now what? 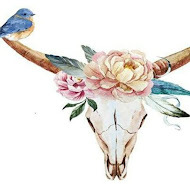 I recommend you sign up for my newsletter to the right so you don't miss a thing! Also, come join me on TSU ! The only social media app for couponers that pays you to post! 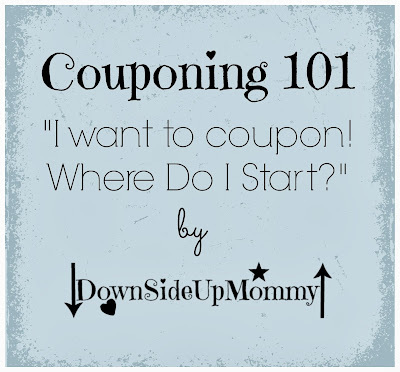 I've read a lot of Couponing 101 posts and this is the first one that I think I can follow... so far! I look forward to the rest of the series. Thanks for sharing and linking up with Countdown in Style! Don't forget to come back on Friday to see if you were featured! Thank you so much that is so kind ! I know there are a lot so im happy to know this one appeals to you. I will make sure to check back to see ifi was featured! it can be very rewarding! thank you and youre welcome! I had never thought about buying multiple papers before I started reading couponing sites. Our stockpile is still going strong, so I'm taking a bit of a coupon break right now...I'll have to come back to this series when I get the itch again. its so great (and necessary) to have a 6 month+ break every now and then!